“You want a WHAT on our boat”? I asked my wife. “You heard me,” she said. I want a walk-in bathroom with a door just like at home.” “But dear, it’s only going to be 22 feet long and that has to accommodate two full-sized berths, a useful deck, a cooking facility, all the running gear, and a flybridge,” I reasoned. Gwen was unmoved. Our retirement vision was to have a boat we could tow to any coast or freshwater body with an ordinary truck and stay on it for a long weekend. Our boat would only have to accommodate the two of us. I also wanted to avoid slip rental and keep it at home. We decided that 22 feet long and less than 6,000 lb. would be the maximum size. I especially wanted a wood boat with plenty of mahogany. It didn’t take long to realize that we were not going to find a commercially built boat that met our unique requirements so it looked like building one was the only option. I had never built anything as complex as a powerboat. When I received the first sets of plans I purchased, I was overwhelmed with the details. Some looked like the sheaf of charts you would need for a ’round the world voyage. There were hundreds of details that needed to fit together with watertight integrity. How do you achieve symmetry between both sides of a boat? How do you make a fair curve? 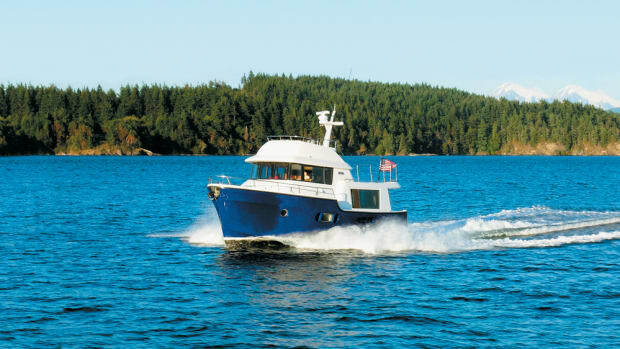 We finally selected a Clark Craft design called Viking as it was intended as a center console offshore fishing boat. I noted the high freeboard, the deep V-hull, and the roomy cockpit, which would make her a fine seaboat. But as I studied the plans, I became more and more apprehensive about accomplishing such an ambitious dream. I had friends all around me who had garages filled with unfinished projects and rusting derelicts that stood as tombstones to their failed enterprise. Could I become one of them? In our small town there was no boatbuilding culture. I would truly be on my own. I would have to teach myself as I went. I took stock. I was an active 60-year-old with some time available and sufficient resources to underwrite the project. I had a working familiarity with tools and I soon became mesmerized by the dazzling array of cheap power tools that are available today. UPS could bring whatever in the world that I needed to my doorstep. There is an unprecedented availability of cheap fasteners, and epoxy would even make me into a boatbuilder. I eagerly waded into the substantial literature on boatbuilding on the web. I discovered that I had chosen excellent full-scale plans that needed very little lofting. I was still tentative, but I committed to the project. I began by commissioning the building of a shop. It would be 1800 square feet with 20 feet of headroom, climate controlled with plenty of light and a bathroom. It has been my observation that too many boats are enthusiastically begun, then wither and die simply because of the brutality of the building conditions. 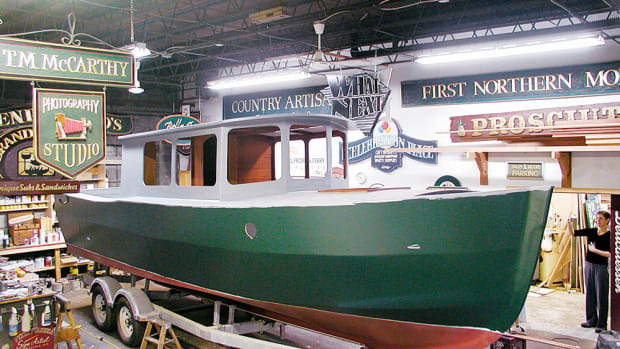 Notwithstanding the fact that many fine boats have been built under tarps in a rain forest, or in a New England fruit cellar during winter, the amateur builder would find it difficult to sustain enthusiasm under these conditions over a long period of time. Besides, I might not stop with just one boat. I started by tracing then cutting the frame components from mahogany, and then fastening them together with epoxy and square-headed stainless screws. The completed frames were then erected square and plumb on the building jig. The transom and stem were built up to 2 inches thick with layers of plywood and epoxy, and mounted on the jig—it was a straightforward cut and paste that even a child could master. The keelson, chines, engine stringers, and other longitudinal members were cut from mahogany, scarfed as needed and fitted into appropriate notches in the frames. Once I figured out how to cut a scarfing bevel, even this posed no great problem. With the framing complete, each member was beveled with a power planer to insure that the plywood skin would lie nicely on the frames. This was pretty risky, but as I took my time, I avoided problems. The hull was skinned with 3/8-inch okoume plywood for the sides and 1/2-inch for the bottom. I wish I could report that I had made an accurate pattern for the pieces, but in fact I hung the plywood over the frames and cut off everything that overlapped. Once fastened and glued to the frames, the entire hull received a lamination schedule that consisted of a layer of chopped strand mat to build thickness and then two layers of glass cloth set into epoxy. Finally, the whole assembly was coated with epoxy thickened with fairing compound. There were some serious misadventures with epoxy during this process and I discovered that you don’t really sand epoxy—you grind it. Fairing or smoothing the hull was the stage I found most demanding. Weeks of mindless, back-breaking labor with the long board are required to produce the slick finish Jervis Bay wears today. In fact, most people think she has a steel hull. Rolling the hull over into her floor dollies is a moment of supreme satisfaction for any builder, and it was the first indication that I could actually finish the boat. After the sanding stage was over, friends began to drop in to offer words of encouragement, which further boosted my resolve. When the hull was smooth and fair, I rolled it into my new paint booth and gave it three coats of black Imron paint. By then, my self-confidence was sufficient that I departed from the plans to design and build my own topsides. I established the sheer line by eye and made the decks from 1/2-inch MDO (medium density overlay). The cabin was built from the same MDO, and glassed and epoxied the same way as before. The cabin roof or bridgedeck was built with a small camber, so it required no further support. Construction of the flybridge was challenging because weight topside absolutely had to be minimal. To accomplish this I bonded a large block of structural foam onto the cabin roof. Using an electric carving knife, I carved the block into a pleasing semicircle that surrounded the seats and dashboard. The foam machined nicely without tearing as Styrofoam would have done. I bonded a second smaller foam block under the dash and between the seats, which I shaped into an oval to hold the switches and breakers. When I had the shapes I wanted, I saturated the foam with epoxy, a layer of glass cloth, and then did the usual fairing procedure. I installed a figured mahogany dash, which could be completely removed by backing four perfectly visible thumb screws. Volvo instruments and high-quality seats rescued from a Lexus completed the bridge. An important design consideration was to keep everything topside smooth and uncluttered. All of the deck fittings were of the pop-up design. Handrails were molded into the bridge combing. Instead of screwed on navigation lights, I used Jeep Cherokee parking lights with their lenses colored red and green, and molded smoothly into the bridge profile. Engine intakes and exhaust made use of Vetus grills molded into the hull rather than the usual deck air scoops. I thought it was important to be able to inspect and get to every inch of bilge. Numerous deck hatches and inspection ports accommodate this while providing additional below deck storage. I installed all the internal wiring, water, and hydraulic lines, as well as the fuel system. Two 18-gallon fuel cells and a 20-gallon freshwater cell were installed in the deepest part of the bilge to further counterbalance the bridge. Two bilge pumps that could pump a combined 7,000 gallons of water per hour were installed on an electronic water-sensing switch in the bilge. The sacred head contained a pressurized water system and a Sealand Marine Traveler toilet was enclosed in a small walk-in cabinet behind a louvered mahogany door. A reading light made it “just like home.” Two 7-foot berths were installed under an escape hatch in the bow. The entire cabin was insulated with closed cell insulation to deal with heat reflected off the water on a hot summer day. A 5.7L Volvo small block V8 and a Duoprop outdrive were installed. The mahogany engine cover tilts forward to provide complete access to the engine for service. Using a Sawzall to cut out a hole for the lower unit in a finished transom is an exercise in confidence if there ever was one. Finally, the boat was pushed back into the paint booth to receive three coats of arctic white Imron paint on her topsides. The upholstery, mahogany trim, and stainless fittings were completed in a few weeks and I had the cruiser of my dreams. Jervis Bay lives up to her performance expectations as completely as she fulfills my esthetic expectations. She is lively and quick, and the view from the bridge is spectacular. The accommodations are perfectly adequate for two people for a night or two, and of course, she gets plenty of attention on the water. But even if she did not, she would still have provided me with more personal growth than any other enterprise of my life. Consistently overcoming seemingly bewildering problems forges a man—it makes him more tenacious and less willing to accept failure. Obstacles presented during the build were material problems—something a man could get his hands on and deal with rather than some abstract concept that evades analysis and resolution. During this build I learned many things about why beginners get discouraged and give up a build. Often it starts with one bad mistake. This happened to me, but I realized that anything I spoiled, I can fix. It just takes more time and more material. People will only see the builder’s final attempt and they will judge his craft by that. Another great lesson is to do something in the shop every day, even if it’s just to sweep the floor or put the tools in proper order. This maintains the spiritual bond between the craftsman and his work, and it gives him time to plan the next step. A realization I came to during the long days of fairing the hull was the occasional need for a sabbatical. This is a smaller, easily managed job that can be dragged out and completed as a ‘spirit booster.’ When the builder returns to the big job he will find his confidence renewed and refreshed. A most valuable lesson is to plan out each step in your mind before you ever pick up a tool. Ask yourself these questions: What materials are needed and do I have enough? Which tools will I use and are they in good order? This will save countless bad starts and endless trips to the supply store. My final lesson is the importance of a good support system. First, of course, is a supporting spouse who does not park the car in the boatbuilding shop. Builders should also surround themselves with other old fuds who know how to weld and fabricate simple mechanical parts, and untangle complicated problems. Besides the wealth of experience these guys represent, they are invaluable for maintaining a builder’s enthusiasm during the months and years it may take to complete a project. Dale Hamilton is a retired Army doctor with 23 years service in Army Special Forces. He did indeed build more than one boat which can be seen on his website at www.mahoganyheartthrobs.com.